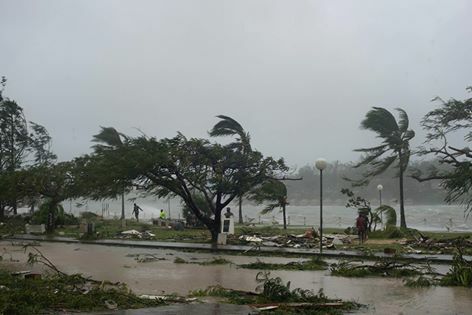 The closure of the main airport in Vanuatu is hampering the humanitarian response to cyclone Pam, which tore through the Pacific island archipelago yesterday, causing colossal damage. The airport in the capital, Port Vila, is still flooded and trees are blocking the runway, Vincent Omuga, deputy head of the UN’s Office for the Coordination of Humanitarian Affairs Regional Office for the Pacific, said on Saturday. “There are lots of plans to provide regional humanitarian support, but the challenge is that the airport is not open at the moment. There are indications the government will open the airport to military flights: Australia and New Zealand have plans to move in, and UNDAC [UN Disaster Assessment and Coordination] have a nine-member team on standby, but all flights are currently suspended,” Omuga told IRIN. Reports describe the tropical cyclone packing winds of up to 270 km/h as “devastating” and potentially one of the worst weather disasters in the region. There are unconfirmed reports of casualties, but aid agencies are warning it will take several days before there is a full picture of the storm’s impact. Omuga said the government’s priorities are to open the airport, repair damage to hospitals, and clear the roads closed by the category 5 cyclone. It is expected to declare a state of emergency to facilitate the humanitarian response. “Power lines are still down, there is lots of damage to infrastructure and lots of houses have been destroyed. Many provinces are flooded and inaccessible, and the islands on the eastern side [of the archipelago] were especially affected,” Omuga said. Even a temporary damage assessment in Port Vila is constrained by the extent of the flooding and the trees and debris blocking the roads. Aid workers on the ground “have not gone out of the capital, and not even all of the capital [has been surveyed]. What they are reporting is what they can see from leaving their vehicles and walking around,” said Omuga.